Electric Hot Liquor Tank — the Inspiration. I started doing all grain beers about 4 years ago. All grain gives you more control of the process, and opens up a huge array of flavors from malts you just can’t really access as an extract brewer. However, with the added control and options, comes added equipment and a bigger investment in time on your brew day. Once I moved to all grain, I had the problem of having only one burner. 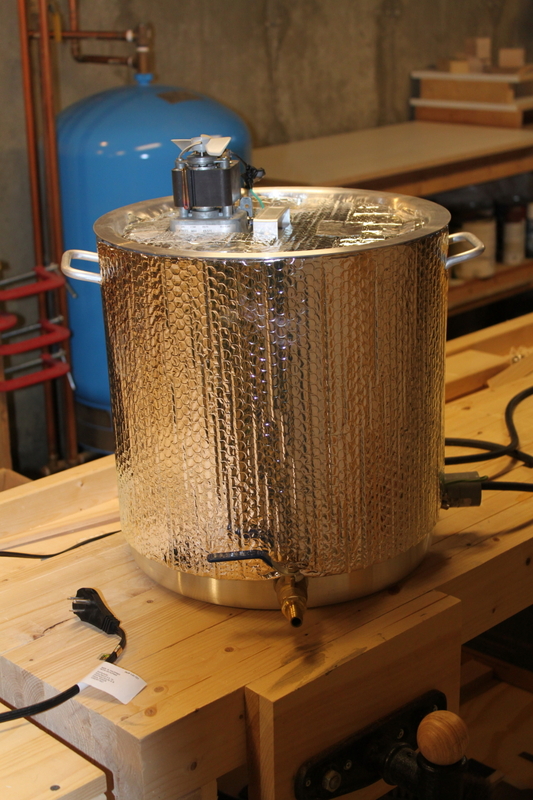 I could heat my mash and sparge water on the burner, but had to transfer it to the mash tun. I did this initially by putting my burner on top of a table with the hot liquor tank, then having it feed via gravity to the mash tun, and then out of the mash tun down to the kettle on the ground. Because I had only one burner, I then had to take down the hot liquor tank, move the burner to the ground, and put the brewpot on top of that. Lifting the 8 gallons or so of hot wort in a 10 gallon pot up on top of the burner was always fun, I mean, what could possibly go wrong! So, I needed a new system. At first, I was going to buy a second burner, but one of my frustrations with the hot liquor tank on a propane burner was you either have to babysit it or you often overshoot your temperature goals for the water. Also, the water cools off more quickly then you would think, so you are turning the burner back on several times to keep it at a steady temp. It sounds like a small thing, but this is supposed to be fun and I found this part of the process tedious. So, I did not like the second burner idea, and needed a plan B.
I snooped around the internet, and came across all the electric brewing rigs on homebrewtalk.com. Most of those rigs were for brew kettles, which require more power then I had available. However, I did come across this one page about an electric hot liquor tank in a 5 gallon cooler. It seemed to be the start of a good solution, but I was very worried about the whole water/electricity thing. However, after talking to some friends who are much more knowledgeable then I about electricity, I decided to give it a shot. I certainly have had moments of trepidation on this project, but now that I have done it and started using it, it has made a quantum leap in my enjoyment of the whole process of home brewing. In subsequent posts, I will go into the details of what is in essence a big 10 gallon electric teapot with a thermostat. I hope to show how this works, what parts I used, and the thought process behind the build, as well as what I would change if I was to do it again. However, if you decide to take this on, please remember electricity and water are a dangerous combination, and the amperage from a standard wall socket is certainly enough to kill you. This will document how I did it, but if you decide to embark on this path, you do so at your own risk. I.E. if you kill yourself it is your own damn fault. I don’t pretend to be an expert in this area, just showing what worked for me. If you decide to pursue this, do your own research and think through what you are doing. Also, make absolutely sure everything is grounded, and everything is run through a gfci outlet for extra protection. If you don’t have a gfci outlet installed, you can buy an adapter that will plug into your existing outlet. On that cheery note, we will proceed!